It’s nothing short of a miracle, watching the sun rise. Think of all the factors, all the moving parts of the universe that click like the cogs and wheels of a clock to bring you to this moment, to witness this spectacle. Think of the slow drift of stars, the constant revolution of planets, the way they shift and slide from another with no ulterior motive or purpose other than to exist. Think of the millions of other ways a day can begin and how one perfect morning means many different things coming together at the right time and place. And from a human perspective, it’s not even just about being at a particular time and place; it’s the culmination of past events and occurrences, of actions and consequences, of decisions and error dusted by the magic of fate, destiny – whatever you call it – and the natural progression of life. I came to Myanmar looking for a miracle. You live day to day and get lost sometimes, your nose to the grindstone, the midnight oil burning away; and when you do raise your head for a breath with circles under your eyes and questions in your mind, you find that only a miracle can save you. 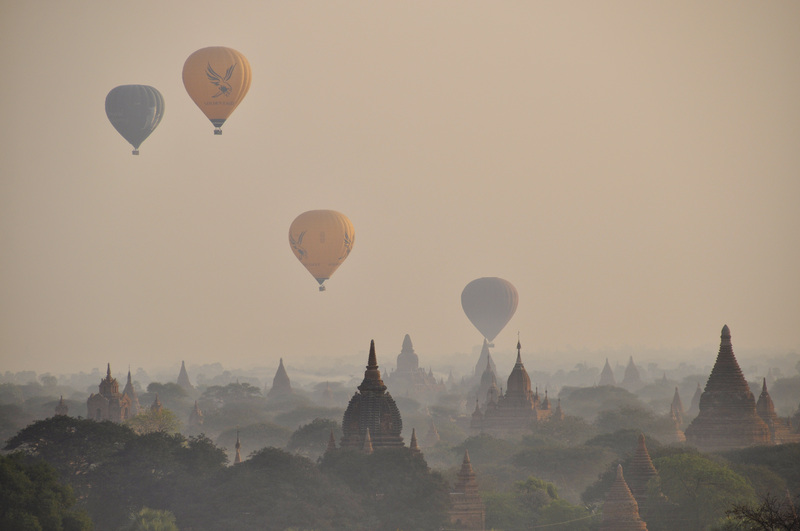 I set my eyes on Myanmar, where my older sister now works and lives, and scoured the internet for photos until I found Bagan. 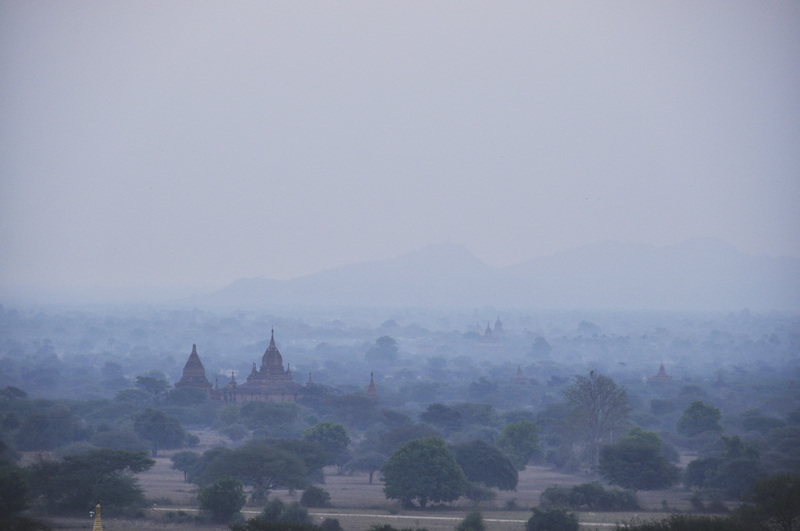 Beautiful, mystical Bagan with its mist covered plains and centuries-old temples lying quietly in wait. And the balloons! 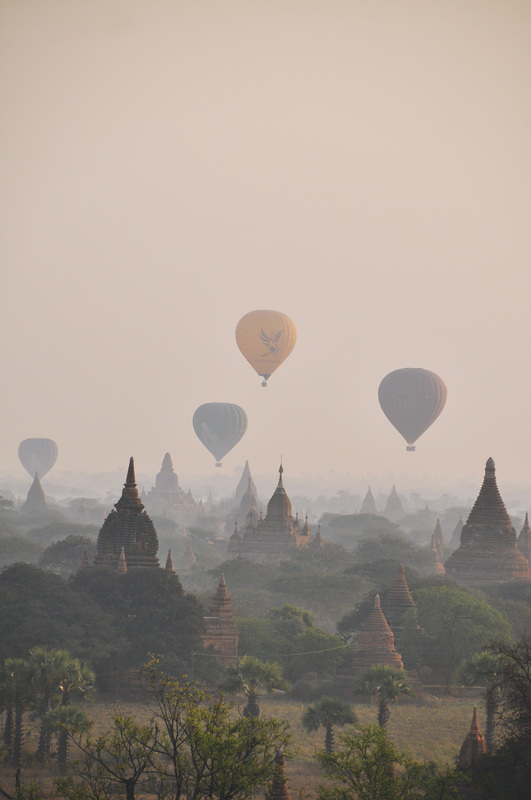 I was captivated by the sight of those giant balloons hovering above the stupas and pagodas spiraling upwards like stalagmites, dawn breaking through the horizon. I knew I had to go. So I did. 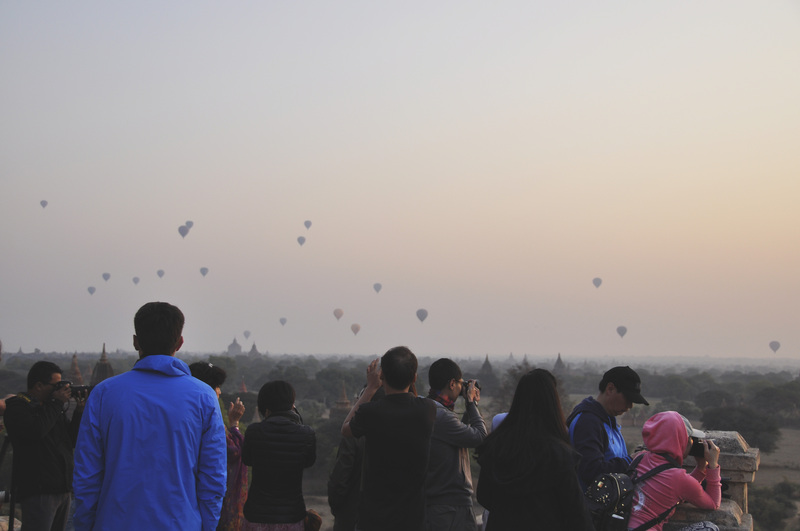 Together with my sister-in-law, I arrived in the bustling city of Yangon, took a plane and flew north to visit the cool town of Inle Lake, and then finally, we arrived in Bagan. To say that the land is still untouched would be a lie. 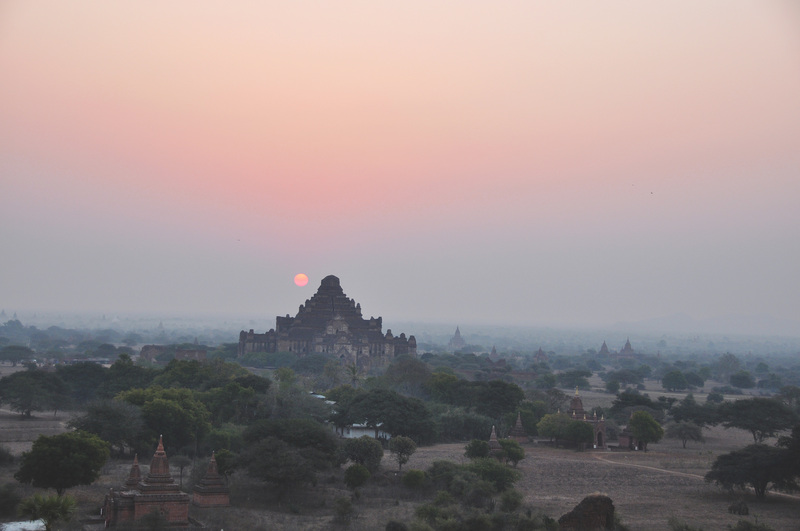 What Pablo Neruda said of his arrival to Rangoon in a poem, I say too: I came late to Bagan; everything was already there. The hotels, the restaurants, the tourists – all of them had already laid their claim to the land before I had set foot on its red soil. 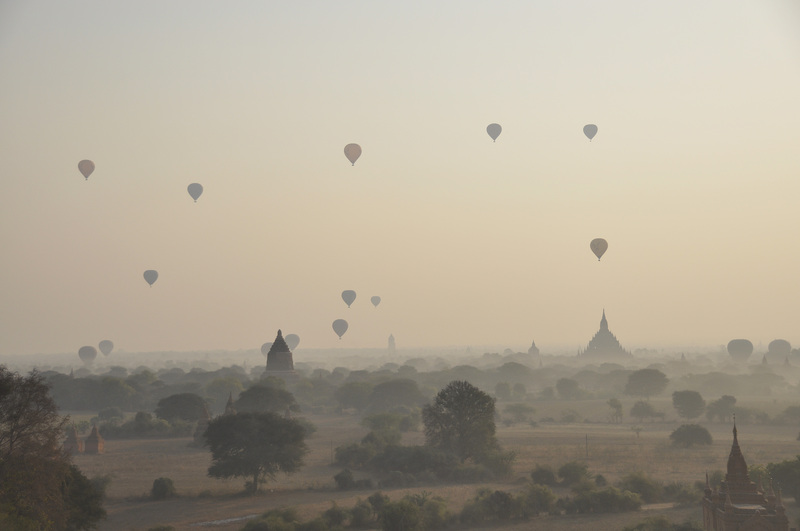 Bagan is making a beeline for modernization and commercialization, its path straight and true; but still, I found her beautiful. 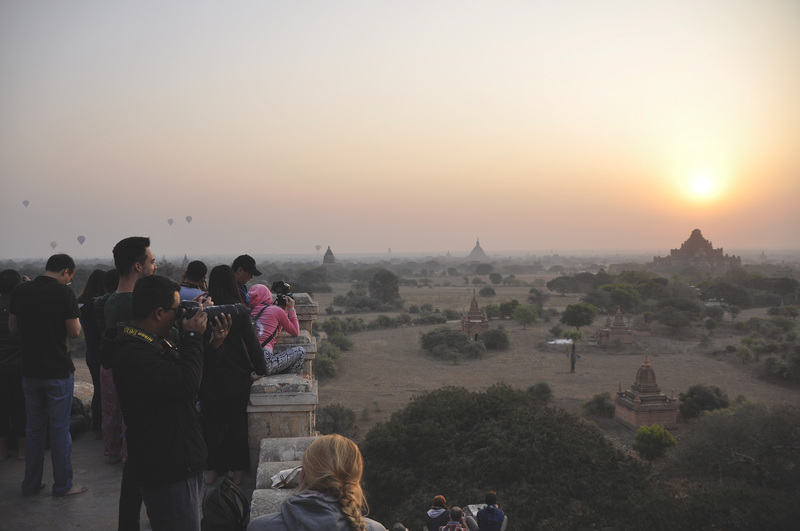 One cool morning, we rode our electric bikes to Shwesandaw pagoda and climbed the steep stairs to the top. I took a seat on the rock ledge, my feet dangling over the edge. 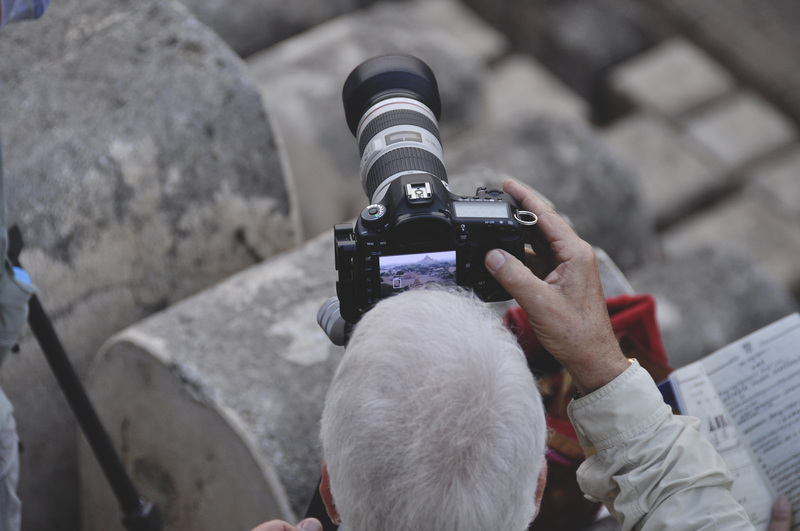 A couple sat in front of me, exchanging caresses and loving glances at each other, while a group of French guys and gals stood behind me, joking and babbling in their language. One of them carried a bottle of Johnny Walker in his bag. By the corner directly facing the east stood more tourists from all over the world holding their cameras, tripods, and GoPros, eager to capture the sunrise. We all waited and click-click-click-ed with excitement. Darkness lifted from the plain, revealing a landscape colored in a dusty blue. 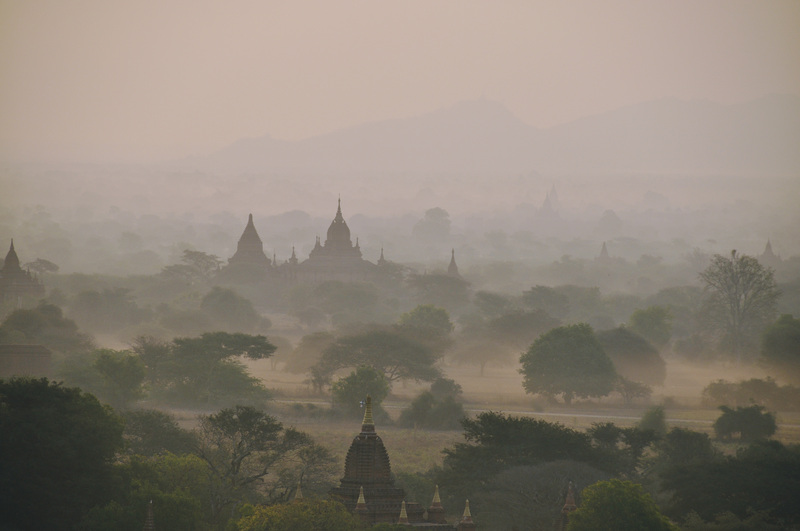 You could just make out the tips of temples and trees above the mist, which coiled and swirled around the base of structures and trunks like a silver snake. We waited, our faces to the east, as a flock of birds flew past and encircled back. We watched the patch of sky above the horizon blossom into warmer shades of orange, pink, and yellow, the hues blending together like watercolor. The birds flew by again and again, cawing loudly. 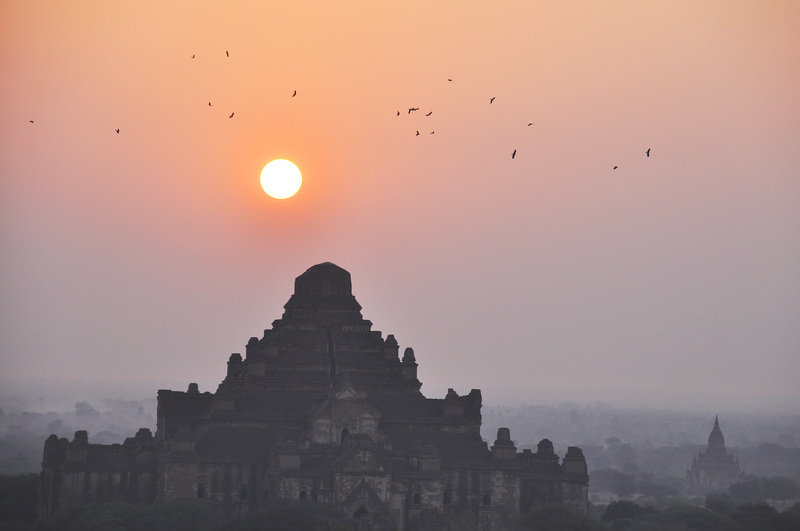 Then finally, the sun appeared as a faint outline behind the largest temple in the plain. I jumped off my seat and pointed at it excitedly, “There it is!” The sun materialized into a deep orange orb as it climbed steadily and reclaimed its place in the sky. We watched the morning light transform the landscape into a lovely and surreal painting, its delicate light combined with the mists rendering everything imaginary and otherworldly. Soon after, the balloons floated by and it was magic. How often does one come by such a scene? I was overwhelmed so I said my thanks to God, the universe, to whoever else was listening. Thank you for this miracle. 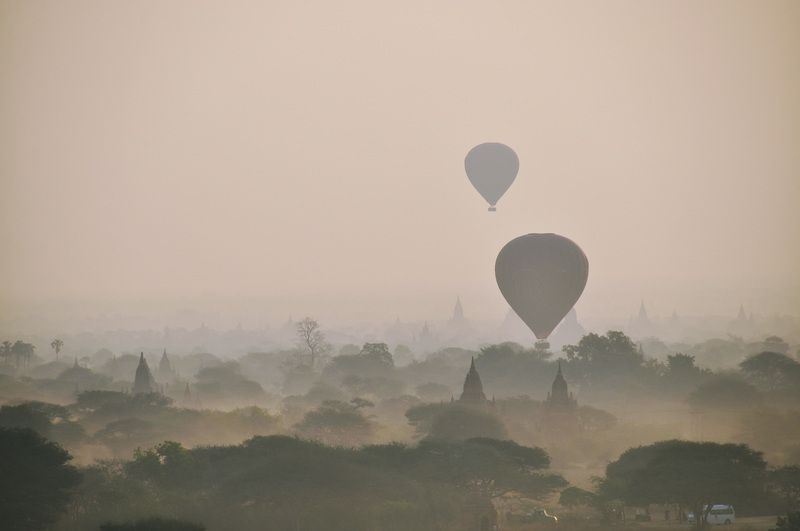 We descended from the pagoda just as some of the balloons made landfall somewhere in the middle of the plain. I came away burning with the same questions and uncertainties I had at the beginning of the trip. There was the startling realization that while a miracle is amazing, it isn’t the answer to everything. At best, it is a life vest thrown at you to stay afloat – a brief moment of joy and salvation – but after that, you are on your own again. It’s up to you what to do with it. You must brave the tumultuous seas, find the raft that brings you to a sand bar then an island then a continent and from there who knows where? But I found comfort in knowing this: that there is order in the chaos, however brief and fleeting, that miracles come as often as they go, and that sometimes, the universe conspires to bring all the right conditions together at the right time for those who come looking for them.